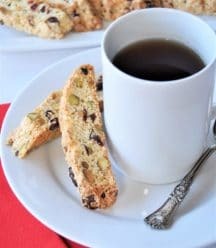 Biscotti is such a classic Christmas cookie in our house. We’ve finally figured out how to make them vegan, and we’re sure that you’re going to love them as much as we do. It’s about time! This vegan cranberry pistachio biscotti cookie has been driving me crazy for the past two Christmases! This is the cookie that I shared at holiday parties for decades, until I went vegan, then I thought that the days of my famous biscotti were over. I tried numerous egg-replacers, but the texture just never turned out like my original recipe. They were either too chewy or too hard. The last thing I wanted was for someone to break a tooth or loose a filling because of my cookies. I needed to find an egg-replacer that would mimic real eggs and make a cookie that was crunchy on the exterior and have the perfect chewiness on the inside. Thanks to the miraculous and fabulous chickpea brine known as aquafaba, I’ve finally cracked the code to the perfect vegan biscotti. Have you tried baking with aquafaba yet? If not, you really need to. It’s amazing stuff. 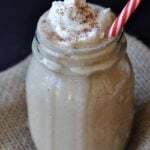 You don’t have to mix anything with water, it doesn’t taste like banana or apple sauce, and it seems to have the same chemical reactions and binding agents as eggs do. I’ve made the most gorgeous meringue with it. I’ve made kickin’ jalapeño cornbread that’s so fluffy and not dry. And now, I’ve finally created my traditional holiday biscotti with cranberries and pistachios. I literally almost cried tears of joy when I took the first bite of this batch. This is a fun cookie to make because it requires getting your hands dirty. 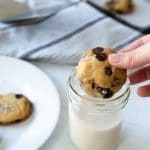 It’s not enough to stir it with a spoon, you need to knead it like a bread dough, and then divide it and form two logs of cookie batter with your bare hands. A great activity for the kids. And did I mention that this is a one bowl cookie recipe? Yep, it’s super easy in regards to clean up. 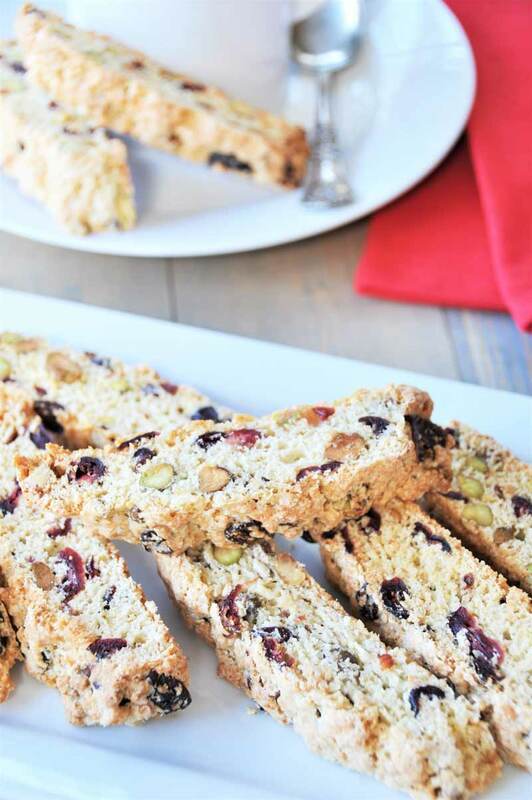 There are five simple steps involved in making this cranberry pistachio biscotti recipe. Add the wet ingredients and stir until the dough starts to stick together. Put your hands in the bowl and knead the batter until all of the flour is incorporated and it forms a ball. Split the ball in two and make two long logs with the dough. Bake the logs for 25 minutes and remove and let cool for fifteen minutes. Slice the logs, making approximately 1” thick cookies and lay them flat on the baking sheet and bake for another 20 minutes. 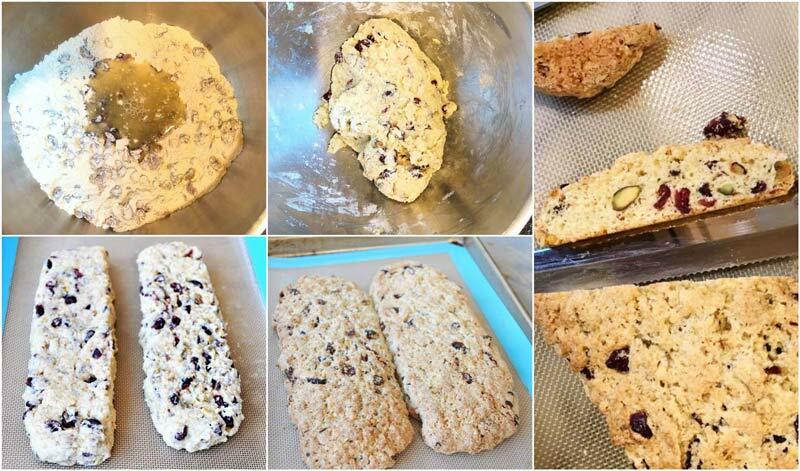 The first time I attempted to make biscotti—about a hundred years ago—I thought it was going to be so hard, because of the kneading and baking twice. 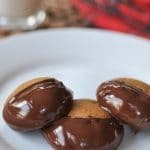 It wasn’t hard at all, and they became my favorite holiday cookies ever. I found the original recipe in an old cook book that I lost during our last move. I think it was accidentally put in the donation pile. Fortunately, I memorized it because of the numerous times I made them, and then when I learned to use a PC (don’t laugh), I saved it. Now that I’ve finally created a vegan version, I can share them with you on my blog. See how far I’ve come? Honestly, starting this blog has helped me grow and learn in so many ways, and for that I am so grateful. As we kick off the holiday season with Thanksgiving, I wanted to share a few things that I’m most thankful for. I’d love to hear what you’re thankful for. I’m a true believer in the power of writing your truth. From your thoughts, to your eyes, to your hands, to paper (or screen), to the universe. This blog, and you, my dear readers. You keep me going, and encourage me to learn something new every day. Thank you. Cooking, seasons, running, tennis, technology (most of the time), my husband’s sense of humor, education, my camera, and spinach. I’m going to take Friday off and enjoy having my family all in one place for the weekend. Have a wonderful and Happy Thanksgiving! See you all on Monday. Do me a favor and let me know how you like these. And if you get the chance to take a picture of them tag me on Instagram, @veganosity or #veganosity. I love seeing your beautiful creations! A crispy and chewy biscotti cookie that's perfect for the holidays! Preheat the oven to 350° and line a large baking sheet with parchment paper. In a large mixing bowl, whisk the dry ingredients together and make a well for the wet ingredients. Pour the vanilla and a 1/2 cup of the aquafaba into the well and stir until just combined. Add more aquafaba by the tbsp if needed. The dough should be sticky, but not wet. Make sure your hands are clean and begin kneading the dough until the flour is fully incorporated and it forms a ball. Kneading the dough will make it firmer. Gently remove the logs from the cookie sheet and place on a clean hard surface and slice diagonally into 1 inch slices. For best results use a sharp serrated knife and gently saw through the log. Don’t press to hard or you may crack the log. Patience is key! Lay the cookies flat on the cookie sheet and bake for approximately 20 more minutes or until lightly golden brown and firm. Store in an air-tight container for up to a week or freeze for up to three months. Thank you! They would make a lovely hostess gift. FYI, three days in and my husband said they're still perfect. I had to stop myself from eating them after the first day, haha! Yay! i can't wait to see it. It's one of my favorite holiday cookies. :) Have a Happy Thanksgiving, Rebecca! Delicious. I made a batch but mine was cherry pistachio with almond extract. Yummy. Hi Sweta! They get a bit hard and crispy on the exterior and the inside of the biscotti is chewy. This looks amazing, such a gorgeous and festive holiday recipe. May need to try at a family cookie party - thanks! I would love to dip these in a hot cup of coffee! 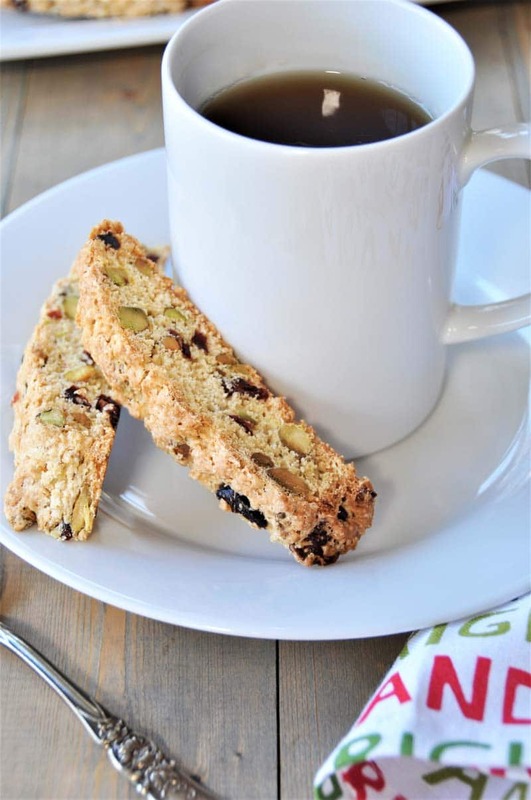 Love dipping a crispy biscotti in coffee or tea! So good! Oh my gosh, yum! I love biscotti!! The crispy texture is what does it for me. I want to devour all of these! I love the idea of giving homemade biscotti cookies for gifts! I can imagine how good yours tastes dipped in a cup of tea. They make such a great gift. Thanks, Amy! i made biscotti every holiday season as well. you version with pistachios + chickpea brine is fantastic. i will certainly have to try that. They're one of my favorite holiday cookies. Thanks, Dixya! Can I use a sugar and flour replacement? Hi Vanessa, yes, but I can't guarantee that they'll turn out exactly like my recipe. These look perfect! 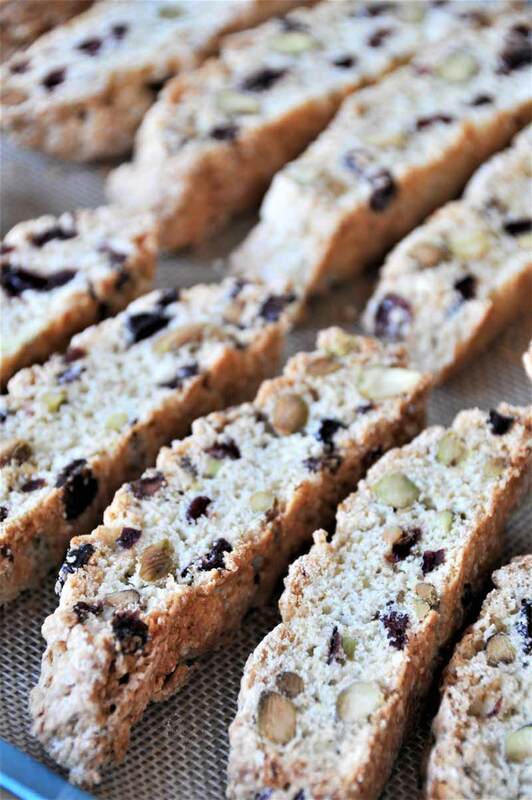 I have a cranberry pistachio biscotti recipe on my blog too, but yours look crispier (but not in that break your teeth kind of way). I'll have to try it with aquafaba next time for sure! Thank you, Aimee! 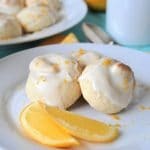 I've tried so many egg alternatives to get the recipe just right, thank goodness for aquafaba! I love biscotti, but after converting to vegan i thought there is no way of getting all these items, thank you for the recipe. These biscotti looks so festive and delicious. I have never used 'chickpea brine' in biscotti recipes but would try next time I make some. Thank you, Molly! Definitely try using aquafaba for baking, it's pretty awesome. I can't believe I've never made biscotti! 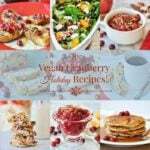 Your holiday-flavored recipe may just get me inspired enough to try it this year! It's such a fun cookie/biscuit to make. I hope you try them! Oh, you've reminded me to make biscotti again - it's been ages since I have! Cranberries and pistachios one of my fave combos! Love how you included "spinach" as something you are thankful for! It always helps to be thankful, even for the little things :). I'm thankful for this post, because it came at a much needed time :). Can't wait to try it. 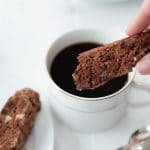 I have been looking for a good vegan biscotti recipe for ages. Have tried several, but this one is excellent. Don't miss the eggs or butter from my traditional recipe at all! With the exception of using anise instead of vanilla, and reducing the sugar a bit, I just followed the recipe as is and it was great. Thanks for posting it. Hi! Thank you so much for the kind words. We're so happy you like our recipe. :) The use of anise is such a great idea. We'll definitely try that. Happy holidays to you! I followed the recipe, but the dough came out really, really wet. One cup is a lot of aquafaba, I had to use two cans of chickpeas, and I had to add more than an additional cup of flour in order for it to come together. How wet is it meant to be? It would be helpful to have a description in the recipe and to add to only add the aquafaba by the tablespoon until the dough is the right consistency. But it ended up coming out tasting really great, regardless! I'm eager to try the recipe again with that modification. I used walnuts instead of pistachios and the flavor is great. I just ran out of chickpeas! Do you know if I can sub an egg or two with similar results? Hi Staci! Yes, it should work with an egg.